Having talked extensively to Julia on this subject and having listened to her conclusion that neither Salina nor Danna takes particularly good photographs, I hope this posting proves once and for all who takes the better photos. I also was using by far the oldest and lowest resolution camera. Update: Eventually I lived in Shanghai and took many many photos some of which were posted to social media. I also collected the best photos and the best posts from my time in China. Two of these photos were taken in Yu Yuan which was a highlight of our visit. This is a Ming garden and one of the best gardens in South China. This was Julia’s favourite place we went to in Shanghai. It was also the first place we went to following the Fodor’s itinerary. Nanjing Lu is THE shopping street in Shanghai, but none of us spent any money here. It was more aimed at locals perhaps. After living in Shanghai I switched my allegiance to Huaihai Lu. Next is just one section in the 1000 Buddhas room of the Jade Buddha temple. You are not allowed to take a picture of the most famous Jade Buddha, but you can buy a postcard of it which I did. Below is a picture of the Shanghai Museum as seen from People’s Park. This was supposedly the best museum in China, but I only got to see one floor of it. What can I say I wasted my time reading about the exhibits. It also has a huge bookstore where you can buy books but it has an attached gift shop which sells most anything. The prices are not cheap but the selection especially if you are interested in history books is good. 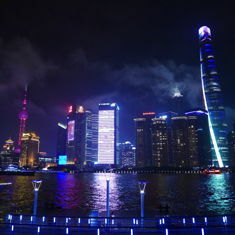 I’ve since taken many more photos of Shanghai at night after visiting again and moving there as my career continues to not go well since my MBA. To get to the New Territories we took the tourist tunnel. It is very trippy, made more so by me using a slow exposure for some of my pictures. It is quite expensive so I recommend only taking it one way or not at all if you are on a tight budget. To the right is the (at the time) tallest building in Shanghai and the moon. We went here to drink. On the 87th floor is “Cloud Nine“, the formerly highest bar in the world. To get there you have to take three elevators. They have a minimum charge of 120 RMB plus 15% gratuity per person. To celebrate and to make sure we made our minimum charge I ordered a Johnny Walker Blue on the rocks. I then had a a Guinness. They don’t have a very good selection of beers especially if you want draft. The Guinness came in a bottle. They have a lot of wine and Scotch though, but not so much bourbon. The final photo is a portion of a model of how Shanghai will look in 2010. Note the even taller building over by the Pearl Tower. If you go to the World’s Fair much of this should be complete. This model is in the Urban Planning Museum. It is quite impressive. The scale is wrong for 40K and is closer to Epic but still off me thinks. I did return to Shanghai in 2014. I never went up the now tallest building in town, but I did go up “the can opener” several times to have a drink. I even went to Hong Kong and went in the tallest bar there, that was an expensive but memorable evening. I went to Shanghai the first time with Julia who also blogged about our time there, Salina might have too, but she never did tell me where her blog is. 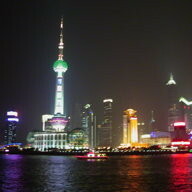 If you have any questions about Shanghai you’ve stumbled on the right blog. You can ask a question below. I’ve already written a tourist guide and given advice on photographing the skyline. This entry was originaly posted on December 28th, 2005 , it was last edited on February 9th, 2019 and is filed under: Asia and tagged: China, Nanjing Lu, Photos, Shanghai, Yu Yuan.